Finding a half decent racing game for the iOS has been struggle. Not surprisingly, the touch screen doesn’t lend itself well to the “cautious optimism” to “pants-shitting tension” range of emotions I experience when immersed this genre. That being said, Slingshot Racing has found a nice little way around the classic game mechanics that can spare my screen, and therefore my wallet. There is no acceleration or turn buttons, so you are left with a one-touch system wherein you shoot a rope at nearby towers and sling around corners, trying to hit whatever boosts you can in order to gain an advantage on your opponents. This makes for a simple, easily leaned game. The game features solo levels, up to four player local multiplayer, and Game Center multiplayer. You can either earn points to unlock new single player races or pay at once to have them unlocked. The microtransactions in this one don’t really inhibit the experience, so I’ll keep my freshly-sharpened pitchfork in the shed. All in all, this is a simple game, to be summed up with a simple question: do I still want to play this game after the review? Well, given that I managed to talk myself out of a Boxing Week deal on a Nintendo 3DS and Legend of Zelda: Ocarina of Time, I’d say yes. 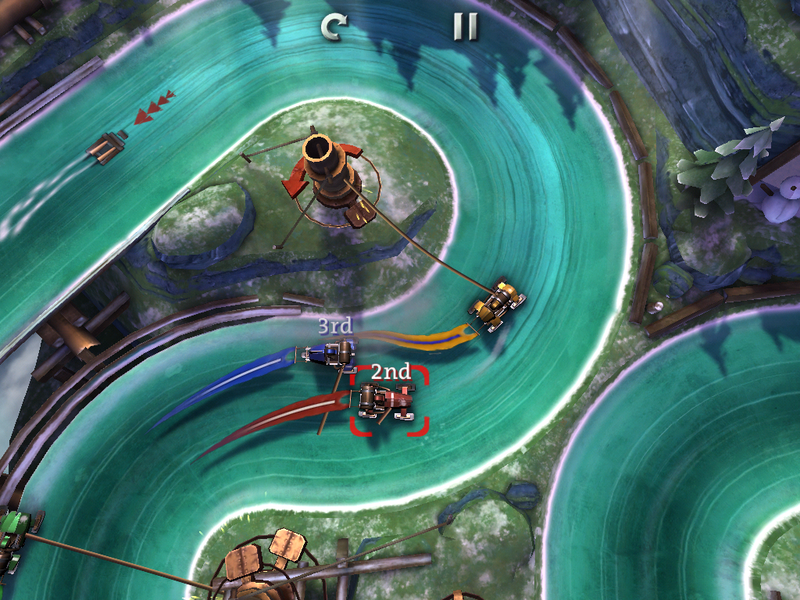 The mechanics are simple and the action is fast-paced. What more could you want? Besides a 3DS. Why, oh why, did I pass on that 3DS?